The book “My Name is Jorge: On Both Sides of the River” by Jane Medina is a vivid portrait of a young boy’s personal experience in a new country. 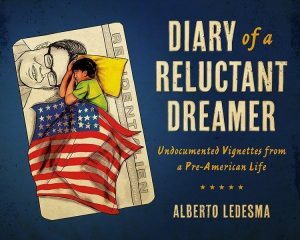 Through bilingual poetic prose, the author manages to capture the constant struggles a Mexican family endures while crossing over the Rio Grande to the United States. Hardships such as making new acquaintances, learning a new language, adapting to new customs, and retaining old values to survive are all poetically presented in this captivating collection of short poems. As it is written from Jorge’s point of view, the book presents his perspective on hearing his name pronounced with an English accent and to his disappointment, English language acquisition presents a huge obstacle. Jorge’s new educational experiences revolve around his time in the classroom where invisibility is desired so as to go on unnoticed in order to avoid being laughed at. A clear comparison between the Mexican and American educational systems is presented when Jorge realizes that he was smarter in his native tongue and land. The poems express the heart-felt sorrow that Mexican-Americans endure in order to adapt and flourish in a land where acceptance is not easily acquired. The author’s poetry is sure to captivate readers of immigrant roots and for bilingual classrooms where educators may emphasize Jorge’s universal struggles to adapt in a new country. This poetry collection is bound to be cherished by many!